A complaint of $1.5 billion damage was sent to Anatoly Chubais, the president of Russian Joint-Stock Company "Unified Energy System of Russia", and directorate of Sayano-Shushensk Hydroelectric Power Plant by two of Tuvan districts: Ulug-Khem and Chaa-Khol, whose areas were flooded by the Shagonar water reservoir. 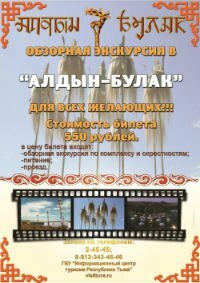 This was announced by IA Tuva-Online with reference to Tuvaenergoinvest, which defends the two Tuvan municipalities. Tuva was named among sixteen other Russian regions which could face an energy deficit this winter. In contrast to just three regions which had energy problems last winter a list now lists thirteen additional regions. This was announced yesterday by Anatoli Chubais, chief of Russian Joint-Stock Company "Unified Energy System of Russia". Tuva, with its 1.1% energy consumation growth during the first eight months is among these sixteen regions.